We are able to match your existing building with steps, skirts & ramps. We can also ensure that the overall effect will remain aesthetically correct. Already made platforms and steps are kept in stock, however we prefer to assess the site before and after installation to ensure that everything is fitted properly for the ground conditions. Steps, skirts & ramps are made to comply with current DDA regulations and in liaison with building control. This ensures that there is ample room for wheelchairs, with correct resting places, anti-slip and nosing’s fitted. Brick or concrete construction can be carried out, if required, to increase the stability. 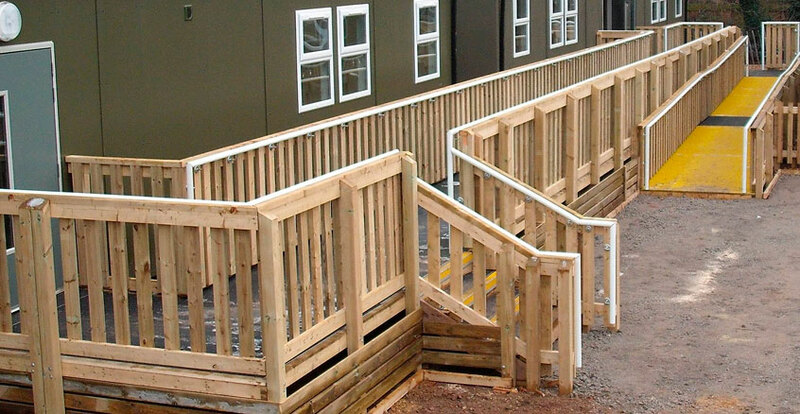 At SJ Stanberry & Sons Ltd, we regularly use tanalised timber in the construction of our steps, skirts & ramps. This will give them a longer life span and also creates a natural, attractive view of the building . Our timber structural calculations were designed by Cambridgeshire County Council, this ensures that the gradient of ramps are correct. There’s a variety of materials that can be used to construct your new steps, skirts or ramps, ranging from timber to galvanized steel. We can discuss with you your exact requirements. Our dedicated, specialist team has vast experience in designing and installing new steps, ramps & skirts along with many other exterior options that are available. We pride ourselves on our expert knowledge and friendly customer service. We offer a free site visit, where by we can assess your requirements. We will also be able to give you a free, no obligation, quotation. Call us today for yours.